With a slightly contoured back, this bronze swivel barstool provides the perfect place for you to lean back and relax. Inspired by classic Industrial and Mission styles, this swivel barstool from Elm Lane offers a handsome look for your home. It features a smooth wooden seat and back, supported by a metal frame in a glitter bronze finish. Set it against a kitchen island or bar counter for convenient seating. 41 1/4" high x 15 3/4" wide x 18 3/4" deep. Seat is 29" high from the floor x 15" wide. Weighs 18.4 lbs. Langdon armless swivel barstool from Elm Lane. Glitter bronze finish over metal frame. Birch and eucalyptus wood seat bottom and back. To match others I have. what is the diamter of the seat? BEST ANSWER: The seat is 15 inches in diameter. Is there somewhere in Connecticut I can go and see this bar stool on person? 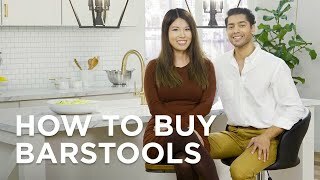 BEST ANSWER: This stool is not available in Connecticut locally that we are aware of. Very good bar stools for a certain style of course. My delivery was right on time and everything arrived in pristine condition. I had no cause to use customer service. The wood is very similar to the semi circle bar that fits in the corner of the livingroom - the old bar stools were dated looking. These bar stools look great with the existing bar and are comfortable as well.